Hello ATPF friends! 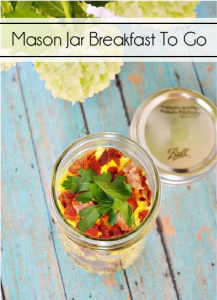 Julie here from redheadcandecorate.com where it is brutally cold. Our wind chill in Michigan got down to -35 recently. That is just crazy. 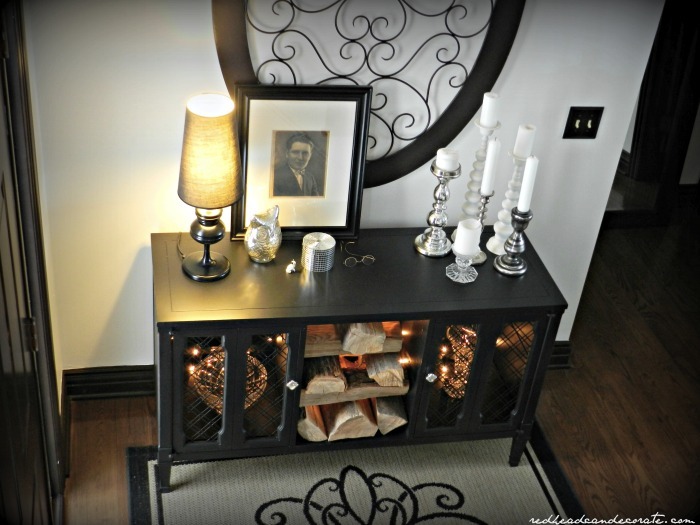 However, I have my tea and blanket and I’m here to share one of my all time favorite DIY furniture makeovers with you…my “Black Stereo Console Makeover”. Two Summers ago, my neighbor sent me a private message on Facebook asking if I would be interested in an old stereo console. She said her husband actually made it over a couple years ago, but she had decided that it was finally time to donate it, trash it, or…give it to Julie. I asked my husband, Rick, to pick it up in his truck on his way home from work. It sat in our garage for a couple months, until I decided to bring it in and give it some TLC. I immediately loved the little X’s in the windows and I knew I could open those up to display some of my favorite crystal. I also knew the little knobs would be easy to replace. The big question was…what color should I paint it? Well, as you can see, I went with black. Black is my “go-to” color for everything. To me, black is timeless, rustic, and elegant. I used Behr Ultra paint in black (eggshell sheen). Painting this piece was easy after I removed the curtains and sanded a little. My husband removed some of the remaining “guts” (and knobs) and he also put a new base on the back. I painted the entire console with 2 coats. 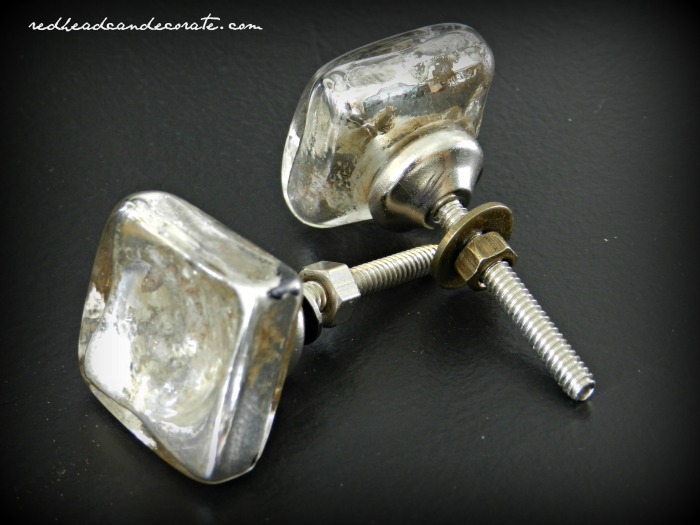 I replaced the knobs with these pretty mercury glass knobs from Hobby Lobby. I also decided to add white Christmas lights inside to help illuminate my crystal. It was then that I decided a “faux fireplace”, or wood storage area would be really cute in the center. We use a ton of wood at our house in the Winter for our fireplace, so this fits into our “style”. It really fits in nicely in our foyer. I can re-style it over and over according to the season. I hope you will try using black for your next paint project! See you back here again soon and as always I’d love to have you stop by and visit me at Redhead Can Decorate! We have a gift for you! 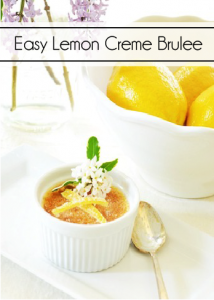 Get your FREE copy of 6 Ways to Have a More Peaceful Home! 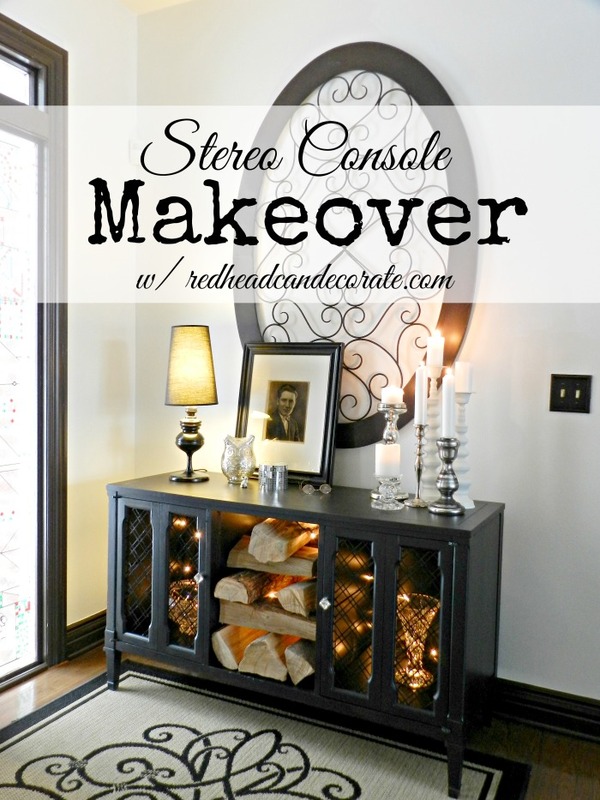 21 Comments on "Stereo Console Makeover"
Great makeover, Julie. I agree….black is always a good “go-to” color. But…the stand out feature for me is the wood. Unique. Forward thinking. And..just plain fun. Thx for sharing…enjoyed it very much. Absolutely gorgeous! 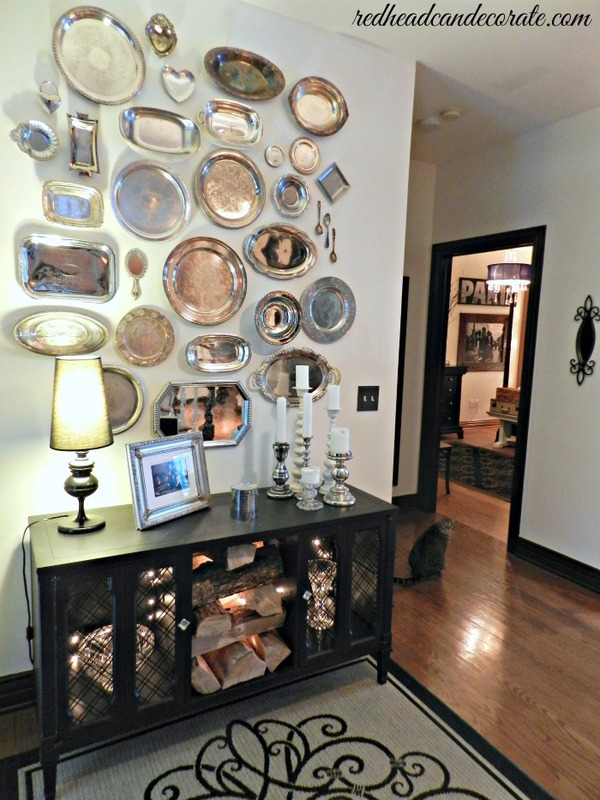 I love the silver plate collection on the wall too! Thanks Lisa…silver & black….oooooo la la! Amazing, what a change. Please tell me how do you paint? In a spray booth, spray paint in cans or sprayer? I use a good old fashion 2 1/2 inch Purdy brush, Suzanne. My husband put himself through law school by painting for a living during the day. He became an expert! 😉 He has taught me a good brush is always the best way, and I agree. Of course spray paint is better on hard to paint surfaces. He never used a sprayer, and never had the courage. *I never had the courage. I love the idea of the lights inside the console. Thank you for the great idea! The makeover is beautiful. Julie, what a stunning transformation! It’s fabulous. I’ll be sending this to my daughter. She has a “stereo” sound box in her living room and she has mentioned that it was time to get rid of it… maybe this will inspire her to keep it. Thanks for sharing. I especially like the look of the framed scroll piece with the candles, etc. That makes me so happy…I hope she keeps it too. Let her know that the inside of mine isn’t “perfect”, but It still looks gorgeous and make a great focal piece. Hi Julie, Just wanted to pop in and thank you for sharing this. It’s just lovely! Also wanted to ask you what part of MI you’re from, since I’m from MI, too. CUTE! What did you use “inside” the door frames? Glass, sheer fabric? Nothing…just took down the original curtains and then painted the “X’s”. Pure air! Boy! I wish I had read this a long time ago. 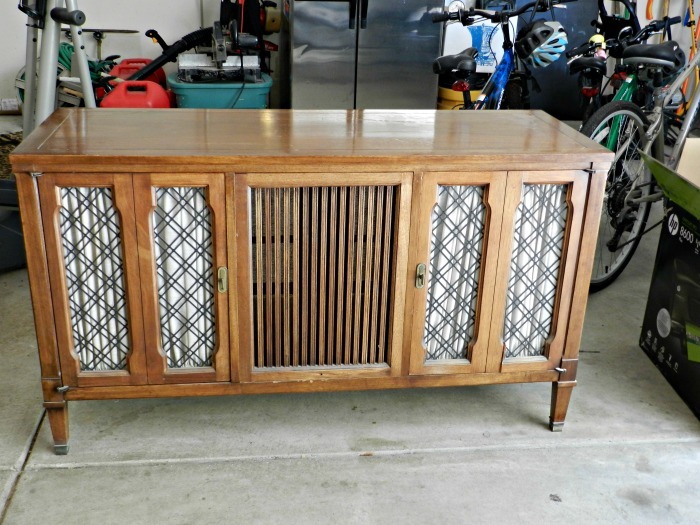 I’ve given away no less than two beautiful stereo consoles that could have made excellent storage. I guess I had blinders on and lacked your imagination. The cabinet is stunning with the lights. Excellent job! Oh darn it!! Thank you, Marisa! Holy hell I love this. 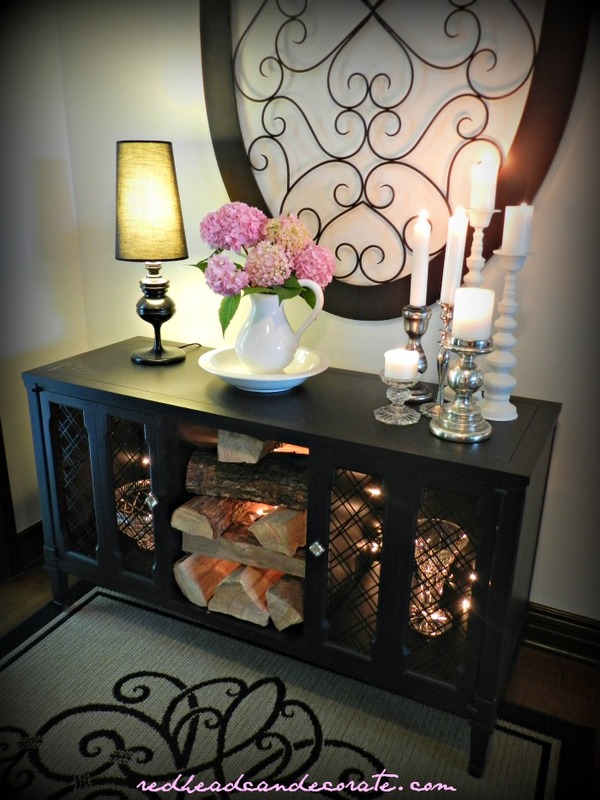 I love the black, I love the knobs, I love it with the silver platters! Well done, miss. Well. Done. lol, Ashley! Thank you so much!! I love your blog. One thing: I didn’t follow you because the page always goes to the bottom before I have a chance to read it! I usually do not comment on blogs, etc. I hope this input will help you. That is my reason for mentioning this. You have a great blog!!!! Thank you Teresa! We just now noticed that it was doing that but have never had that problem before. We’re working on getting it fixed! 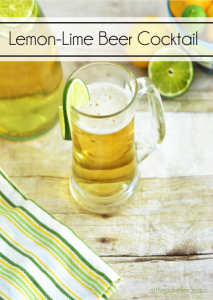 Now Check Your Inbox for Your free Ebook!